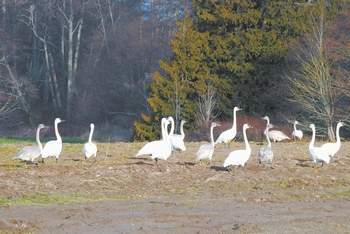 DUNGENESS -- State Department of Fish and Wildlife agents are investigating the fatal shooting of a trumpeter swan, whose carcass was found Monday in a pond off Woodcock Road near Buttercup Lane. Shelly Ament, a biologist with Fish and Wildlife, said that X-rays showed 41 shotgun pellets in the 19-pound bird's carcass. "Since I've been here, I think this is the first one we can confirm was shot," said Ament, who has worked in the Dungeness Valley for 19 years. Trumpeter swans are protected, and killing trumpeter swans, even accidentally while hunting sport species, violates several state and federal laws. 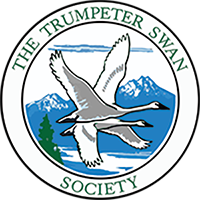 The Trumpeter Swan Society is offering a reward of $500 to the person whose information leads to the arrest and conviction of the shooter or shooters. When and where the swan was shot is unknown, Ament said. The bird was spotted on the pond Friday, she said, and found dead Monday at the far end of the pond with another trumpeter swan nearby.